Today, there are obvious concerns regarding the need to quarantine new stocks before placing them in our main ponds. We see outlets advertising the fact that they have been deemed ‘Bio-Secure’ – either by their own Dealer’s Association or by the governing authorities of the UK who are responsible for giving such statements. Below is a picture of an almost perfect quarantine system owned by a collector in the USA. It holds around 4,000 gallons of water and is filtered as best a portable pool can be filtered. 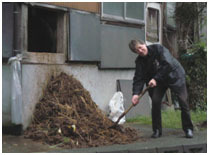 There is also ample and constant supplementary aeration provided to the system. It is situated outdoors and so ample daylight can reach it and a shade is provided for the protection against excessive sunlight which can be fierce in Arizona. 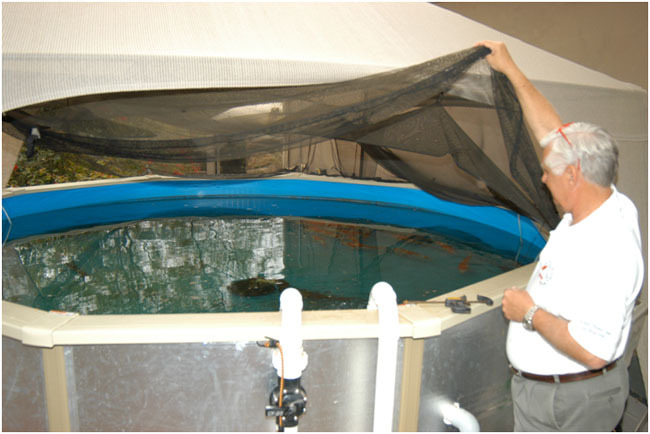 The soft cover net also allows good viewing below and prevents any Koi jumping out or damaging themselves in doing so as they could if the cover was not flexible. Today, there are obvious concerns regarding the need to quarantine new stocks before placing them in our main ponds. We see outlets advertising the fact that they have been deemed ‘Bio-Secure’ – either by their own Dealer’s Association or by the governing authorities of the UK who are responsible for giving such statements. Whilst all this is admirable and no doubt these outlets are very conscientious in their care and attention to the greatest detail, we must always bear in mind that these statements are only as good up to the very day they were actually made. After this time it is vital that no errors are made by accident that would certainly raise questions as to their present ‘Bio-Secure’ status. At the end of it all, we can never be really sure as to the truth of these statements, though I must add that I would far rather trust these outlets than take a wild chance anywhere else. Most of these professional outlets also put all their new stock through very strict quarantine procedures before allowing them to go on sale. Some even do not allow any viewing of the stocks whilst they are being put through various checks and possible treatments – although I have never seen the valid reasons for this self-made rule. Whilst it is true that most Koi enthusiasts can visibly identify Koi that do not ‘behave properly’, they have no way of detecting Koi with a very real ‘problem-to-be’ that has not, as yet, surfaced. Indeed I know of no one with this ‘crystal ball capability’. I do, however, have very real concerns after seeing some of the ‘quarantine set-ups’ over the years that do not come even close to the one shown above. Many are cramped with insufficient water volumes and inadequate filtration systems. The majority are placed indoors in garages or outbuildings and allow very little, or hardly any, natural daylight to penetrate sufficiently to produce the vital algae required. Others put their new stocks through an incredible series of chemical and fluctuating temperature ‘hurdles’ together with some lengthy time periods before they are finally deemed ‘fit’ to be finally introduced to their existing collections. One thing is certain, our Koi do not exactly relish being packed into bags and cartons and then shipped for up to 35 hours half way around the world. Another point to bear in mind is that they must be at their weakest possible state on arrival into their new and previously unknown water make-up conditions. Obviously, at this stage, great care must be taken to give them conditions in which they can recuperate fully. Failure to do this can only increase their ‘already-challenged’ condition. 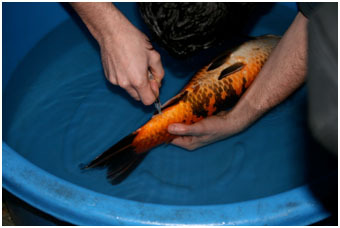 In my experiences of receiving and handling thousands of freshly imported Koi from Japan over many years, excellent recovery from their travel experiences can be easily achieved by releasing them into ample good and heavily-aerated water conditions together with a good dose of ‘Leave ‘em alone’! Yes, there will be parasites present; there always have been in my experiences of it all but these can be successfully and easily eliminated with the correct methods after giving them a few days of quiet recovery. There may well be physical damage sustained by a few unfortunates during the transportation movements where cartons have to be moved from road to air transportation and back again but these can also be attended to by the ones who are experienced in these matters. Checking new arrivals for physical damages and taking random mucus samples. Whilst parasitic problems and the much more rare physical damages can be readily resolved, this does not apply to potential viral problems that may well be visibly undetectable on arrival. This produces a very different situation indeed and, as far as I can see, there is no real way we can ever be able to face this potential problem with anything near 100% confidence. 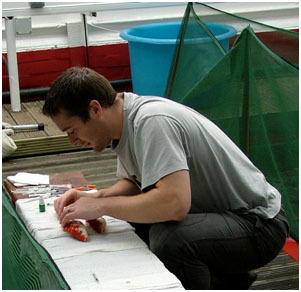 Today, it is the individual Koi keeper who makes the decision to quarantine or not to quarantine new additions to his/her collection versus leaving the matter to a trustworthy Koi dealer. There are many conflicting methods given as how to ensure a new Koi does or does not carry a potential viral problem and here I must ‘pass’ on giving advice as I am nowhere near experienced enough in this matter. I strongly suggest you seek more accurate information from more experienced individuals regarding water temperature changes and the time periods they should be maintained. There are also individuals who are experienced in taking blood samples who can be contacted should the need arise, these people can also ensure they arrive at the correct laboratories in the quickest possible time. Extracting blood sample for laboratory testing. Today there are chemicals advertised for sale that ‘indicate’ to us or attempt to ‘persuade’ us that these are effective in controlling and even curing deadly viral problems although they do not actually state this clearly per se. They are further promoted as being vital for use in quarantine systems. These relate to several derivatives all bearing the trade name of ‘Vircon’. I clearly remember some years ago one intelligent Koi dealer relating to me in detail how one of these preparations must be mixed, and then slowly ‘drip-fed’ into ponds over a period of time. I later watched with some surprise to see a carefully prepared solution of the substance being dispensed into ponds by drip via containers that had a partially opened valve at the base where the liquid fell into the water below. Even later I saw entire ponds being treated with neat powder versions of the identical chemical that were considered to be fed by ‘drip’ only a few weeks prior. It later was produced in tablet form to be allowed to ‘slowly dissolve’ on the base of our ponds – presumably before the bottom drains stepped in. If we are to believe all of this then why are any known viruses that can possibly affect Koi still with us? Surely by now, we would all have ample supplies of this magical preparation stored in quantity for any virus that rears its head? Now, back to the ‘drip’, in my experience there is only one additive used on occasions in a Koi pond that is not affected with severe reduction of effectiveness by way of filter stages, dilution and aeration. That single additive is cooking salt where only the introduction of new water will reduce the salinity, otherwise its strength will remain as added. With every other substance I have used in a Koi pond, they are at their very most effective at the very moment they are added – after this, they deteriorate in their degree of usefulness as the hours go by. In fact I cannot really think of a single one that operates with any real effectiveness after four hours or so in an enclosed re-circulating system such as our Koi ponds. So now we are expected to believe that this ‘drip’ (a very highly technical term for an exact and precise measure of liquid) will become more and more effective as it enters our huge body of water and continues in its magical work as more and more ‘drips’ enter our systems. WOW! Are we really so gullible to take in this hogwash? We were later told that some of us could by-pass these very highly technical ‘drip’ applications by adding the raw powder (which suspiciously smells of bleach) directly to our ponds. I have spent hours watching ponds turn a wonderful blush-pink and also produced foam galore when the initial dose is added. I have watched with great amusement on many occasions whilst this wonder has been purchased and used in Koi ponds but have yet to see ANY results produced, either good or bad, in ANY aquatic applications. If a good all-round disinfectant is required to reduce a high bacteria count in your pond, why not try ‘Chloramine T’? – another bleach-based product, but this is specifically produced for use in the aquatic industry. Not only is it effective, it will also save you a significant amount of money against something that should really only be sold by W. S. Walcott’s Medicine Show. Time for a BIG picture here! And now, please run it by me once again, how exactly does ‘Vircon’ cure KHV? I’ll bet the Vircon exponents are going to warn me next of the inherent dangers of allowing my Koi to swim through a ‘cloud’ of carefully-prepared concentrated medications poured into a pond in one area rather than carefully distributing it around the entire pond perimeter – despite the fact that a short term dip of this same chemical, at fifty times the strength, can be applied perfectly safely for up to TEN minutes – and this cannot allow the Koi to swim away from it! As we all know, there are as yet no ‘cures’ for either SVC or KHV nor are there any preventatives against them – anywhere. If there were, there would be no need to spend further huge amounts of money on research to find this elusive cure. If you are looking to build quarantine facilities for your new Koi or wish to have another system to hand where small Koi can be kept and fed over winter then this next illustration may well be of use. Please bear in mind that AMPLE daylight must be allowed into our indoor ponds in order to produce the fine, moss-like algae that will form naturally on the walls and bases of our ponds. If this is not present then the vital minerals contained in the algae that our Koi eat will be taken away and cannot be replaced by any man-made Koi foods. As a result, the colours of the Koi will fade as a direct consequence of their skin becoming thinner. As the skin continues to get thinner, bacterial problems will follow by ulcerations appearing. The internal dimensions of the pond are 3 metres by 2 metres and the depth of water is 1 metre. This gives a total pond volume of 6,000 litres (1,320 gallons) and should be adequate in holding even a few large Koi for a short period of time. For Koi in smaller sizes this should be an excellent system. The aerated bottom drain is connected to 3” bore tube and taken directly into the filter as shown. All drains and standpipes seen in this example are also in 3” bore. The filter itself is a modification of the ERIC system covered in greater detail on other pages of this website if you require further information. The internal width and depth of this river is 45cms (18”) and the internal length is 2 metres. There are two, tailored cartridge cubes 35.5cms (14”) long and heavy aeration is applied at the points shown. The pump will provide the necessary flow-rate of only 650 gallons per hour with these width and depth dimensions of the filter. 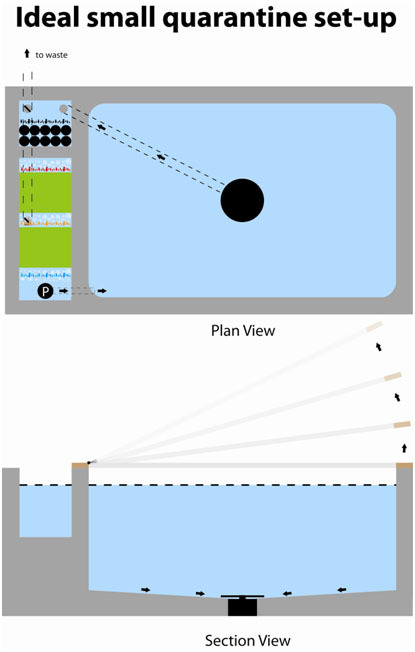 The section view shows the benefits of having a wood-framed, clear polythene cover to allow maximum daylight into the pond and also to keep the Koi in the pond. The frame is hinged as shown and a simple pulley system can be used to raise and lower the cover when required. Should a U/V unit and a heater be required then I would recommend a small surface skimmer is included in the pond build to supply water to these via a separate pump. This entry was posted in The Keeping. Bookmark the permalink.